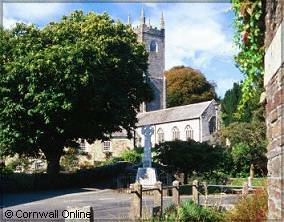 Situated in a moorland parish of North Cornwall are the village of Altarnun, the village of Five Lanes and the hamlet of Trewint. They are easily reached by car, being located just off the A30 dual carriageway 8 miles west of Launceston and 14 miles east of Bodmin. From the North Coast and A39, an easy approach is by the lane that crosses Davidstow Airfield. The best route to follow from the South Coast is via Liskeard, St.Cleer, Redgate and up to Bolventor. Although now almost interlinked, these three communities on the edge of Bodmin Moor still retain their individual character and each have played their different part in the history of the parish. 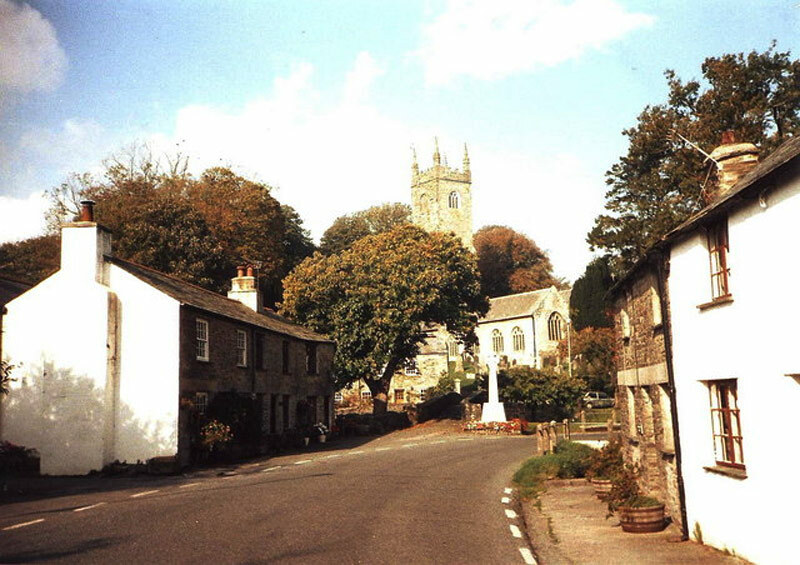 Altarnun, which nestles in the sheltered valley of Penpont Water, a tributary of the River Inny, is named in the Domesday Book as Penpont and can truly be described as one of the prettiest villages in Cornwall. Across the two bridges stands the Church of St. Nonna. The Normans built a church here in the 12th century, but the church as it now stands was built in the 15th century and was partly constructed of unquarried stone from the moors. Surprisingly the tower is 109 feet high, its height being less noticeable due to the backdrop of hill and trees. Notably the pillars are monoliths, as are the capitals and bases. The mullions of the windows are all original except those on the west. The wagon roofs of the aisles and the porch roofs are thought to have come from the Trelawney family mansion which was dismantled when they left the area in the 15th century. The Norman font is one of the few remaining parts of the 12th century church. One of the main features of 'The Cathedral of the Moors' is the signed collection of 79 bench ends carved by Robert Daye between 1510 and 1530. By the church gate stands a fine Celtic cross, possibly dating back to the 6th century, the time of St.Nonna herself. She was the mother of St. David and left her native Wales around the year 527. The holy well of St. Nonna is a short walk from the church and the feast of St. Nonna is celebrated on the second Sunday after Midsummer's Day. Just up the lane from the church lies the Old Rectory, which was built in 1842. Daphne du Maurier, a visitor to the house, featured it in her book 'Jamaica Inn' as the home of the notorious Francis Davey, Vicar of Altarnun. This elegant house, built in the Georgian style and Grade 2 listed, was sold by the church in 1975. To the left of the church facing the village green, which is bounded by Penpont Water on one side, stands a long white cottage which is recorded in the early 19th century as being the 'Poor Houses'. This was run by the local parish overseer of the poor, but was sold in 1871 and is now a private residence. At the end of this short lane stands the Church Hall, which until 1931 was the three-roomed Village School. The Hall still plays an active part in the life of the village. On every Thursday from the beginning of May to the end of September, the good ladies of the church lay out a superb array of home-made food from traditional Cornish pasties, to delicious sweets and many local people make this a meeting point on that day for morning coffee, lunch or afternoon tea. All visitors are welcome. All proceeds are in aid of church funds. A two week Exhibition of Paintings and Crafts is held annually in the Church Hall by the Moorland Art Group and local professional artists are invited to exhibit their work. Across the now restored 15th century packhorse bridge is the picturesque main village with its granite built cottages, Post Office, Village Shop and Butchers. The earliest record of the Post Office is recorded in Kelly's Directory in 1873 when John Davey, as Receiver of Mail served Penpont. Since that day it has remained as a Post Office and still serves the local community. Early closing is on Wednesday and Saturday and the Butcher is only open in the morning. Next door is Maid Marion Stores, which provides groceries for the community in the true tradition of the village shop. Up to the turn of the century this building was the 'Ring O' Bells' Inn and was the meeting place for the many prospectors and miners in the area. It is said that when a miner had a good find, he and his friends would adjourn to the Inn for a two day drink-in, sleeping overnight in the stables, to imbibe again next morning. All the mines eventually closed, but two local mines, Treburland and Butterhill, were reopened at the outbreak of the Second World War to obtain supplies of wolfram, an ore yielding tungsten, which was used to harden the steel for munitions. Apart from local men, Italian POWs were used at Butterhill. Both mines were closed at the cessation of hostilities. The Inn itself was forced to close when it was purchased by Elisabeth Climo, the miller's wife. Adjacent is the old Methodist Chapel, built at the end of the 18th century, with its unusual granite steps leading to the floor above. One day the floor of the chapel collapsed during morning worship and the proprietor of the Ring O' Bells, hearing the commotion, rushed out and shouted at them 'So the Devil got 'ee after all!' Over the door is a head of John Wesley, carved in 1836 by gifted local boy Nevil Northey Burnard, who came from a long line of builders and sculptors. More of his work can been seen on gravestones in the churchyard. He went on to achieve national fame by sculpting the head of the Prince of Wales, later Edward VII. Many commissions followed, but after the death of his young daughter, he returned to the West Country and became a drifter, dieing a pauper's death in Redruth Workhouse in 1878. A plaque to his memory is sited on the house alongside the chapel which is the original Mill House, Penpont Mill. The Corn Mill itself was sited opposite the Mill House, by the existing flower beds and phone box. It stood four storeys high and obtained its water from a leat some way up Penpont Water, the flow of the water to the mill being controlled by a sluice gate. It ceased working in the early 1930s and was eventually dismantled to enable the road to be widened. Annually, the village holds a week long carnival, in the third week of August. This event celebrated its golden Jubilee in 1996. A short walk up the 'sunken lane', reputed to be some 1000 years old, lies FIVE LANES, now by-passed by the A30. The largest building in the village is the Kings Head Hotel. Built in 1623, it was occupied by both Roundheads and Cavaliers during the Civil War of 1642. It has had numerous changes of name. In 1773 it was known as The Indian Queen, 12 years later The London Inn and in 1795 The Five Lanes Inn. It became a staging post for coaches when the second turnpike road, the first across Bodmin Moor, was built in the middle of the 18th century. The ghost of Peggy Bray reputedly haunts the long passage upstairs. Some visitors claim to have felt a chill in the air around the door in the centre of the passage, as though a spirit is present. The village was the focal point for the outlying farms with a livestock market, shop, three blacksmiths, a tailor, a cobbler and a regrater, who was also the shop owner, who would journey out by horse and trap to buy the dairy produce, rabbits and pigs from the surrounding farms, to sell on in Launceston and Plymouth. He kept his own 'Killing House' down the lane to slaughter the pigs. The livestock market finally closed in the late 80s, but the original granite cottages still exist, as does the building that was once the focal point of the village, serving the local community during the last century, it has now been completely refurbished to become the Casa Moor Lodge and Restaurant. A quarter of a mile to the west of Five Lanes is the hamlet of TREWINT. At the far end of narrow Duck Street with its small granite cottages, stands Wesley Cottage, where John Wesley, the founder of Methodism, preached and rested. In 1743 it was the house of Digory Isbell, a journeyman stonemason and his wife Elisabeth and that summer when Digory was away working, two of John Wesley's advance agents, tired and hungry, asked for refreshment at the house and were made welcome by Elisabeth. On leaving they knelt and prayed 'without a book'. John Wesley himself was entertained in the cottage a year later. One evening Digory Isbell read in his bible of the Shunamite woman who built a Prophet's Chamber for a man of God and seeing this as a divine command, immediately set about building a two roomed extension to his house, which could be used by John Wesley and his preachers whenever they were in the district. Trewint became a flourishing Methodist Society, but as other larger chapels were opened, the rooms fell into disuse. In 1950 the Isbell house and the two adjoining rooms were restored and opened to the public as Wesley Cottage. The following circular walks are well colour waymarked and maintained by Cornwall County Council. Visitors are encouraged to use them. A comprehensive guide with full historical content of what may be seen on the routes can be purchased from the Post Office in Altarnun. Please note these premises are closed on Wednesday, Saturday and Sunday afternoon. The Tredaule Walk (The red route) - Distance 1.5 miles - Allow 1 hour. Start from Altarnun Post Office and Stores. The Inny Valleys Walk (The green route) - Distance 6.5 miles - Allow 4 hours. Start from the bridge by St. Nonna's Church. Austles Ford Walk (The brown route) - Distance 3 miles - Allow 2 hours. Start can be made from Altarnun, Five Lanes or Trewint. The Lynher Valley (The purple route) - Distance 5 miles - Allow 3.5 hours. Start from the Kings Head Hotel in Five Lanes. Please leave all gates as you find them, keep control of your dogs and remember that cattle can be very aggressive towards dogs, especially if they have calves. There will be places on the walks which require waterproof footwear.